**TOP TIP** Did you know you can use Shareagift to Group Fund across the social web, not just within your own circle of friends?! People have used Shareagift to raise hundreds of dollars to thousands of pounds for everything from charity fundraising online, collecting funds online from communities even raising money online for medical treatment and starting group funds for friends in need. People love helping other people. Tell the story of what your group fund is for – if it’s a charity fund tell them what the money will be used for, if it’s to help someone tell them a little bit about them. It’s amazing how much people are willing to get involved when they understand the cause. The Baird Family are trying to raise a £580,000 to fund a new medicine to help save their 2 year old son Jack and other children suffering from Sanfilippo disease. Letting people know how your fundraising is going both shows contributors how their donations are helping the overall progress towards your goal, and encourages those yet to contribute to get involved. 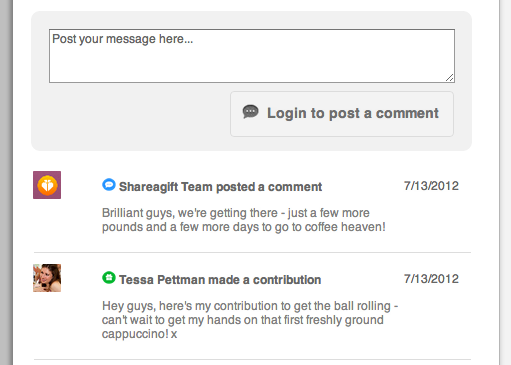 The Comments Wall on your Gift Page can be used by both the organiser and contributors to leave update messages and comments of encouragement and help you keep building momentum. The group can also use the Comments Wall to discuss the gift, what to do with the funds or any other detail in a group discussion.